Good ride in South Herts! It all started well enough. I found waypoint 19 from the station easily (I'm following offroad route number 3 from Nick Cottons book of rides north of London). 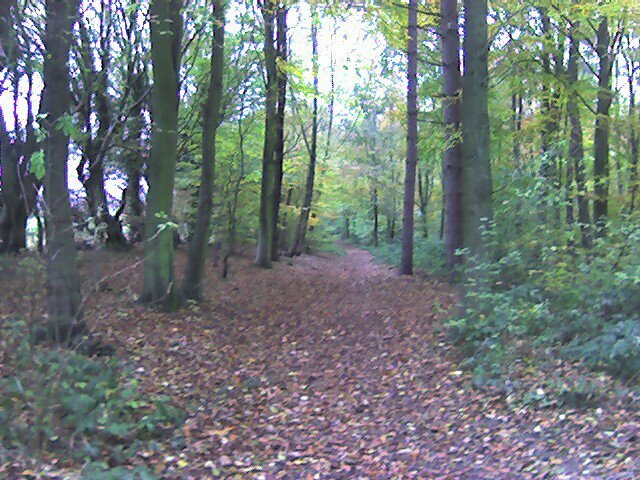 and the riding was gorgeous, too - after a bit of busy road, it was all forest tracks with solid surface carpeted by freshly-fallen leaves. Couldn't have been better. Then things took a turn for the muddy. After about a half hour, I started an interminable uphill on a surface of what seemed to be congealed motor oil. My Paselas are great for most terrain, but not this. 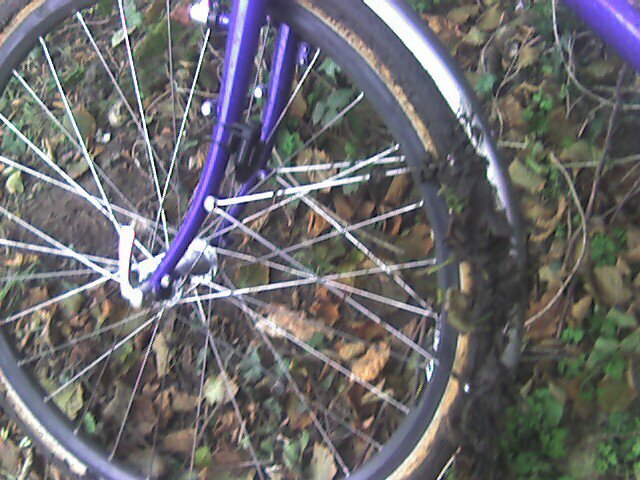 After reaching the top of the climb, my mudguards were so crammed with the stuff that the wheels wouldn't even turn as I pushed the bike along! No real choice then but to take the wheels off and scrape. Or as Gemma would say (more appropriately, even), scoop. Things definitely worked better after that, but I decided it would be wiser to stick to paved roads for a while. I knew I wanted to head towards Bovington anyway, so I just followed signs along pleasant B roads and found my way there after a bit. Along the way, I noiced that my cyclometer seemed to be acting funny - must be the quarter inch of mud packed around it. 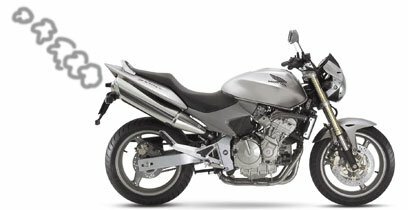 At Bovington, I went into a little shop for a sandwich, figuring that the police car parked out front would mean it was safe to leave my bike for a sec. Inside, the copper was watching the security video with one of the proprietors. I paid he other one for my sandwich with my last two pounds and asked where the cash machine was, and he said "it's nicked!" I figured I'd better head back to my bike... And on the way out I heard them calling after me "let us know if you see it!" It was getting colder then, and I didn't want to risk going wrong, so I took a reliable B road to the Grand Union Canal, which eventually took me back onto the planned route. Lovely riding along there, with lots of swans, anglers, and narrowboats with fires going inside. I stopped along the canal after a while to eat my sandwich (I'd been fueled exclusively by peanut M&Ms for far too long at that point). Not too long after that, I saw the landmark I'd been looking for and popped off the canal right at King's Langley station. So, while not exactly as planned, it was a beautiful ride on a less than beautiful day. The big question now is how I can clean my bike before taking it into the house! I'm on the platform @ Finchley Rd waiting for the Metropolitan line that will take me to Chalfont & Latimer for a nice 22 mile country ride. A train is due soon, but I'm not too optimistic. At least the weather seems to be cooperating today - it's cold and overcast, but no real rain (or snow, as predicted) as yet. I'm prepared for whatever comes my way, though: my Freestyle outfit, plus mid & base layers and overshoes on top of my cleats. Maybe overprepared for such a short ride, but I'd rather not be caught out! I also have my new rear tyre, which I replaced without incident yesterday, and my new frame-fit Zefal pump. Worked great yesterday, let's hope I don't need it today! They also mended my overtrousers, which are a couple years (and at least a couple thosand miles) old. They even fixed a seam I didn't know had a problem. In each case, they sewed a matching Gore Tex patch over the tear and sealed it on the back. Absolutely remarkable service! I'll never buy bikey rainwear from anyone else. I should also have a chance to test out their handiwork tomorrow, with snow and freezing rain predicted. I always look forward to the new issue of Cycling Plus. It's a wonderful mass circulation magazine about road cycling published here in the UK by Future Publishing. I end up reading virtually all of each issue - it has industry news, gadgetry, sport, public policy, and great road tests. 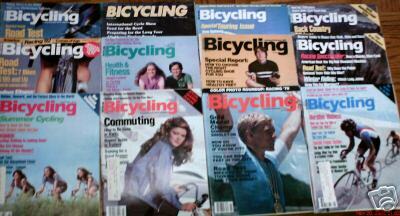 Which is exactly how I used to feel about Rodale's Bicycling Magazine, the only remaining US offering. It's outlived all the other entries (like Bicycle Guide back in the 80s, which I also really liked), but it's really a shell of its former self. It hasn't been interesting since 1990 or so, when the format was changed to be more bite-sized and bullet-pointed. I don't even buy this one when I'm in the US any more. I don't quite understand how the UK can support Cycling Plus and several other cycling mags (including a weekly), when the huge US market can't even have one decent one. In any case, I'm happy with C+ and VeloVision (which is only quarterly and definitely on the fringe), but I do still love the old Bicycling Mags from the 70s and 80s and I watch out for them on ebay. I have a had a few issues sent to me a while back, and they're really good fun. So the other day I came across the mother lode. A collection of 23 years, from 1978 to 2001 for sale by a guy in Pennsylvania. I bid and won, now I have 165 lbs of magazines on their way! Pure madness. I can't wait to get my hands on them, but it will be a while since it's ridiculous to have them sent here, so they'll be in storage in New York for a while. 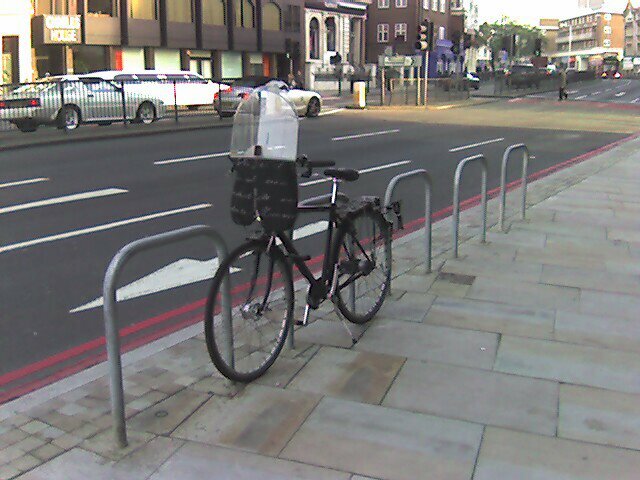 After work in Southwark today, I found that my bike (and all the others on the street) had been leafleted with the Southwark Cyclist newsletter. As much as I support the LCC, I think that this sort of thing is really not a good idea. Most of the leaflets will invariably end up on the street, which is wasteful and an eyesore. It also doesn't do the LCC's image any good when people see these leaflets blowing along the pavement along with day-old newspapers and unwanted take-away menus. I'm sure they could generate much more interest and goodwill by having a volunteer meet and greet cyclists around busy cycle routes - and handing out newsletters to anyone who's interested. I've emailed the coordinator of the group and copied the LCC - we'll see what (if anything) they've got to say. Seems that I'm not the only dismayed about the ridiculous placement of the sheffield stands at Waitrose. Then today, I went by and found that they were in the process of uprooting and refitting all the racks on a diagonal. Still not ideal, perhaps, but definitely an improvement! Makes you wonder what they were thinking in the first place, though. I finally got around to taking the Fahrrad in for a follow-up service this morning. On Saturdays, the Bicycle Workshop does a first-come, first-served thing - but only the first 10-12 people get lucky. So turning up early is a must. 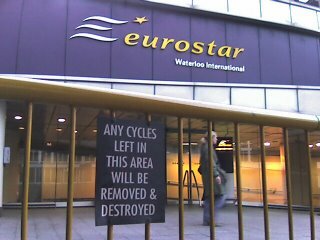 I got there earlier than I needed to (queues are much shorter in the winter) and was on my own from 07.30 until 07.45, when I was joined by a nice bikey chap with a broken spoke. Turns out he's a Mercian owner and an ex-Thorn owner, so we had lots to talk about! Ninon (the owner) turned up around 08.15 and assured me that they'd sort out the Fahrrad and sent me on my way. She also said that they'd be getting in the oil change bits for the Rolhoff hubs, which I'll need pretty soon. 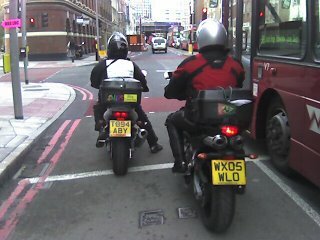 How could this kind of thing be allowed on the road? It may look pretty boss to some, but the angle of these exhaust pipes points straight at the face of any unfortunate cyclist immediately behind. At least the cars & buses spew out their fumes at knee level, allowing them to dissipate a bit before I have to breathe them in. 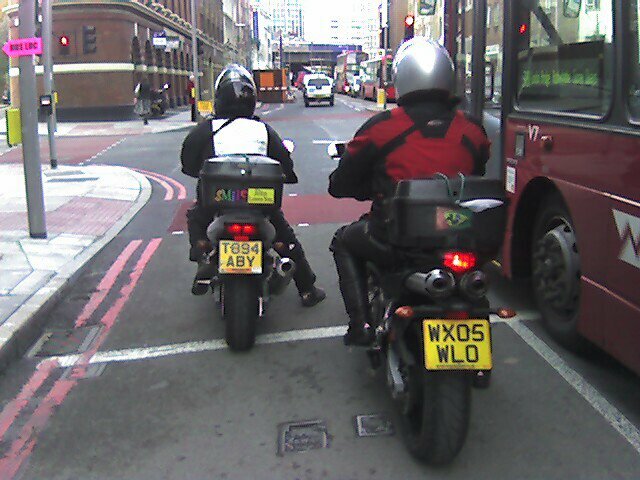 Here's a quick snap I got near Tower Bridge today, showing how it looks from my point of view as a cyclist... note the tailpipes of the one on the right. ... crapola! Here's my bike locked as a normal person would here, unfortunately taking up three of the stands instead of one. And if they'd been installed correctly, each rack would take two bikes comfortably. Today, I took a break from work to visit Andrea Casalotti's new shop, Velorution. It's a fantastical cornucopia of exotic utility bikes. 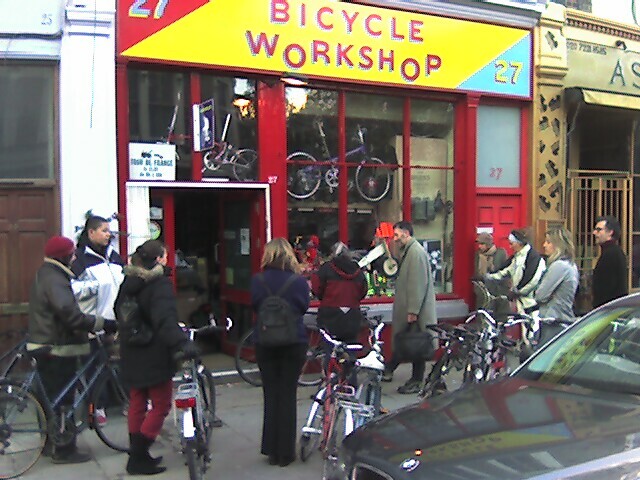 Nice website & blog too - and our bit about the bobike is featured there! What I really wanted to have a look at was the Christiania trike with the nice compartment for kids. Gorgeous! Made in Denmark to order, with whatever options you want. 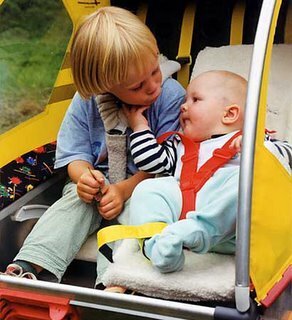 It's no rocket ship, but it would be great for muling two kids plus shopping around - year round. 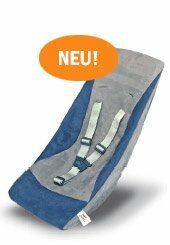 Here's a couple photos from the Weber website. Wouldn't that be perfect for Gem and another? I've noticed that the website of London Business School provides directions via public transport and by car, but not by bike, so I've volunteered to write some directions that they can post on their "Getting to the School" page. Here's the message, which I sent to the general inquiries address and the head of alumni relations; we'll see what they have to say! I'm an LBS alumnus (EMBA96), and I use the library and other facilities at the school frequently. I'm also a cycling campaigner, and I generally cycle to the school. First of all, I've been pleased to see how the number of cycles (and cycle parking) has grown since I was attending the programme here. I also notice, however, that your website (which has also become really very good since I was here!) does not include any directions for those arriving at the School by bike. I think that including directions via cycle, including details of parking facilities at both buildings and proximity to official London Cycle Network routes, would be a real benefit to your visitors and students alike. It would also demonstrate LBS's dedication to sustainability. I would be very happy to write a paragraph that you could include on your "Getting to the School" page if you're interested. I look forward to hearing from you. And as I am on campus frequently, it wouldn't be a problem for me to pop in to have a chat about this. I was cycling home last night from Piccadilly Circus and I was joined by a girl cycling up Regent Street as I was. It was immediately clear, though, that we had entirely different philosophies. 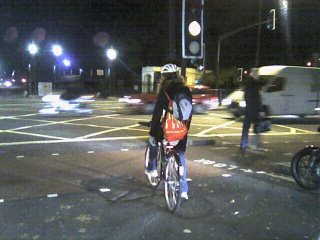 She took every opportunity to jump the light, ride through walk signals, and inch out into traffic where possible. She wasn't aggressive like as messenger, just a careful commuter exercising what she believed to be her right as a cyclist to do whatever she wanted. I had a bit of energy, so I was riding fast from one light to the next, and had no trouble keeping up. Instead of saying something to her, though, I just made her life difficult where I could: blocking the space between the curb and car at a light, forcing her to wait behind me; or overtaking at times that might have been inconvenient for her. Petty, sure - but it did make me feel a little better. Here's a photo of her waiting for a chance to sneak across the Marylebone Road into the park. 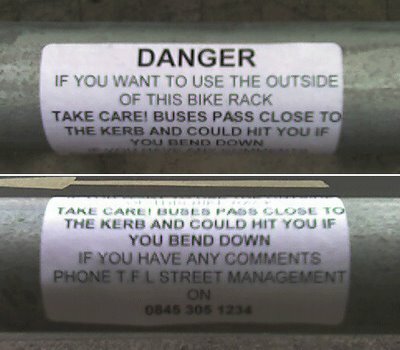 You see signs on "private" railings all over London warning off cyclists, but this one at Waterloo International strikes me as a bit severe! A couple days ago, I sent a message to the CCC email list to see if anyone wanted to do a pre-dawn ride to Windsor today. I planned to follow the National Cycle Route 4 from Putney Bridge, through Richmond Park to Kingston, along the Thames past Hampton Court, to Weybridge, then through Windsor Great Park, and home on the train. Surprisingly, I even got one taker, which was more than I'd expected. We met at South Hampstead station and set off to Putney via Hyde Park and Hammersmith. We maintained a good pace, and soon made up the time we'd lost due to a late (06.50 or so) start. It was light by the time we got to Richmond Park, and it was a lovely ride through the park as usual. Not too many deer, though. It was a really chilly morning (45 degrees! ), so our toes were pretty cold, but it was bright and the air was really fresh, so we didn't mind. Everything was going really well until a dog ran out in front of me on the towpath near Walton. I've been trying to figure out whether he would have moved or not, but I'm quite sure that I would have run the little mongrel down if I hadn't slammed on the brakes. The path surface was hard packed gravel and normally pretty good, but I lost traction and the rear wheel slid to the right. My companion narrowly missed running into me but managed to stay upright, as did I. Everybody heard the pop of my tire blowing but me, apparently - I was too busy trying not to crash and/or kill any dogs. The dog's owner was apologetic, and she went on her way. Then I noticed that my tire was completely flat. Which was really unfortunate and a big surprise, since the Panaracer Pasela Tourguard is regarded as one of the most durable tires around. From what I can gather, when I went sideways, a sharp rock poked its way right through the sidewall into the tube and that was that. I had to think what to do just then since I'd never removed the rear wheel on this bike before. It's meant to be really easy with the Rolhoff hub, which may be the case, but I would have preferred figuring it out for myself with some time to spare - not on a muddy towpath two-thirds through an early morning ride. So instead of taking the wheel off to replace the tube, I managed to patch it without taking the wheel off, but there was still the question of the slash in the sidewall. 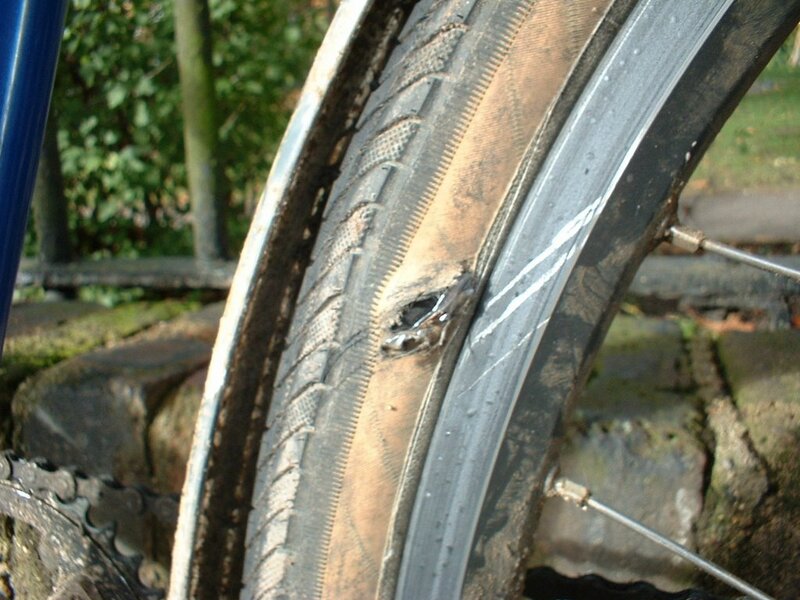 To prevent the inflated tube from popping out like a hernia, I sandwiched another patch between the tube and tire. Incredibly, that seemed to hold. Nevertheless, it seemed to make sense to cut our ride short and head back from Weybridge instead of venturing into Windsor Great Park, where any unrecoverable mishap would only result in walking out again. It was still another seven or eight miles to Weybridge station (not in the centre of Weybridge, of course), but we took it easy and everything went fine. We got a cup of tea for the journey, then took the train back to Waterloo and arrived a half hour later. I'd hoped to get some nice pictures in Windsor, but after the incident I lost my motivation. I did get a shot of the gash in my tire, though. The bit of the patch I stuck between the tube and tire is just visible. Okay, not the ambitious ride to Windsor I'd hoped for, but it was a good ride nevertheless! Now the small matter of finding another Panaracer Tourguard and fitting it before my next ride. 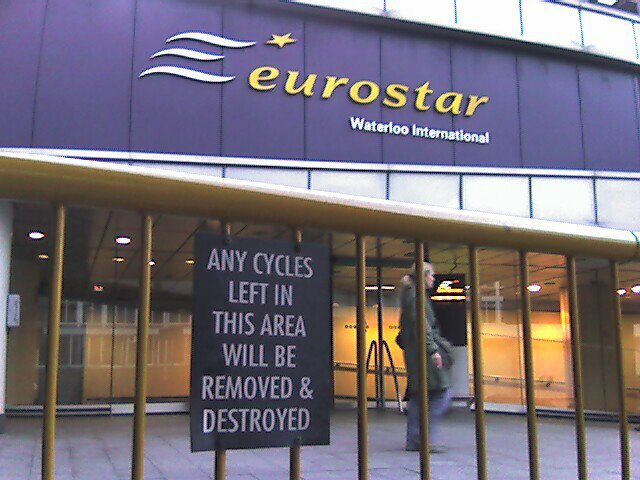 Had to ride down to Waterloo this morning to catch a train to Woking. For variety, I changed my route just a bit and endeed up spending an extra 20 minutes or so on my usual 40 minute journey. This was due to the usual labyrinth of one-way streets combined with major road works around Covent Garden. Maddening! It took me over a year to optimize my two routes to the station (via Bloomsbury & Waterloo Bridge and via Parliament Square & Westminster Bridge), so I should know better. Just like when I go to Wagamama and get something apart from Chili Chicken Ramen and am invariably disappointed.